MeteoEarth is a dynamic weather and Moon phase application. Click & drag on the globe to see the region of interest, and pick the weather features you wish to see, scroll to zoom in and out, hit play and watch the Sun & Moon whiz around for the next 24 hours. Another good resource for checking detailed short-range sky conditions is the Clear Sky Chart. It reads from left to right in a 24 hour time format, ​with 0 being midnight, 13 being 1 PM, and 23 being 11 PM. ​Or click on the graphic below to see the current chart and more detailed information. ​A great application from MeteoBlue is ideal for astronomical seeing conditions. 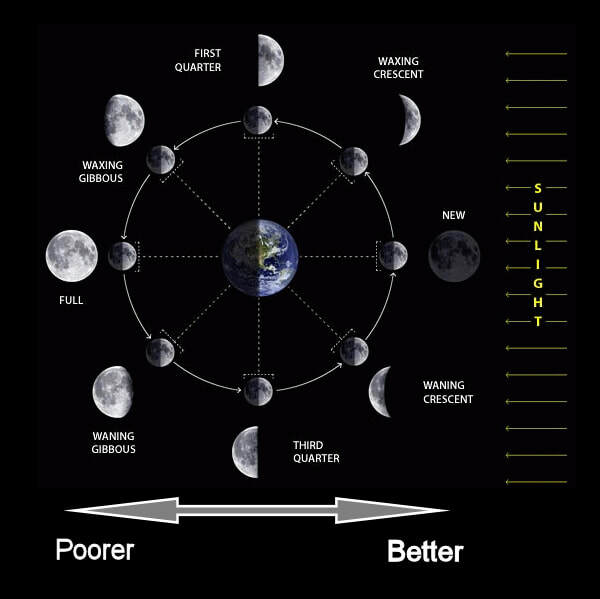 ​If your primary interests lie in viewing "deep sky" objects, please consult the Moon Phases Calendar for new and waxing/waning crescent moon phases when planning your observing.